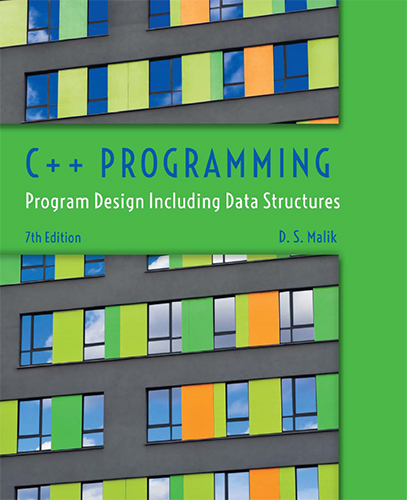 C++ PROGRAMMING: PROGRAM DESIGN INCLUDING DATA STRUCTURES, Sixth Edition remains the definitive text for the CS1/CS2 course sequence. D.S. Malik\’s time-tested, student-centered methodology uses a strong focus on problem-solving and full-code examples to vividly demonstrate the how and why of applying programming concepts and utilizing C++ to work through a problem. This new edition includes updated end-of-chapter exercises, new debugging exercises, an earlier introduction to variables and a streamlined discussion of user-discussion of user-defined functions. Malik\’s text ensures students learn how to apply the C++ programming language, and are motivated to understand the «why?» behind key C++ concepts. — A full-color interior precisely displays syntax highlighting, emphasizing C++ keywords and comments for beginning programmers. — More than 300 visual diagrams illustrate challenging concepts. — Numbered full-code examples throughout walk students through the stages of Input, Output, Problem Analysis, and Algorithm Design to illustrate key topics in each chapter. Every programming example includes a full explanation and sample run. — A CourseMate digital companion brings the text to life with nearly 20 instructional videos that walk students step-by-step step through key programming examples — plus such interactive study tools as quizzes, flashcards, and games. The CourseMate\’s digital Lab Manual offers additional hands-on exercises, helping students reinforce critical thinking through practice.